If Mickey Callaway thought a lineup change would do the trick, it’s safe to assume he’s already back to the drawing board, pondering any possibility imaginable to spark this anemic Met offense. The Mets dropped the second game of the Subway Series, their eighth straight, all of which have come at Citi Field. The offense wasted another quality start from Steven Matz, who’s certainly righted the ship after some early season struggles had Callaway answering questions about his status in the rotation. He was far from sharp Saturday, but did more than enough to put the Metropolitans in a position to win against opposing Yankee starter Domingo German. Matz handed out four free passes on the evening, including one to German, but he struck out six and worked successfully around trouble all night. The only blemishes for Matz were home runs from Baby Bombers Gleybar Torres and Miguel Andujar that evened the score at three apiece. Callaway made some drastic changes to the Met lineup in an effort to shake things up for an offense that had produced just three runs in their previous 51 innings. Amed Rosario, who incredibly had never hit leadoff in his entire life, found himself atop the lineup Saturday and was followed by Todd Frazier, Brandon Nimmo and Asdrubal Cabrera. That all seemed well and ordinary in what was a long-overdue effort to give the offense a boost, but Callaway elected to hit Jay Bruce in the five-hole, ahead of Michael Conforto. Bruce has struggled mightily, literally and figuratively limping his way to a .222/.300/.333 line with just three home runs. He’s reportedly dealing with a foot injury but has elected to tough it out, although he hasn’t looked comfortable at the plate or in the field since early May. 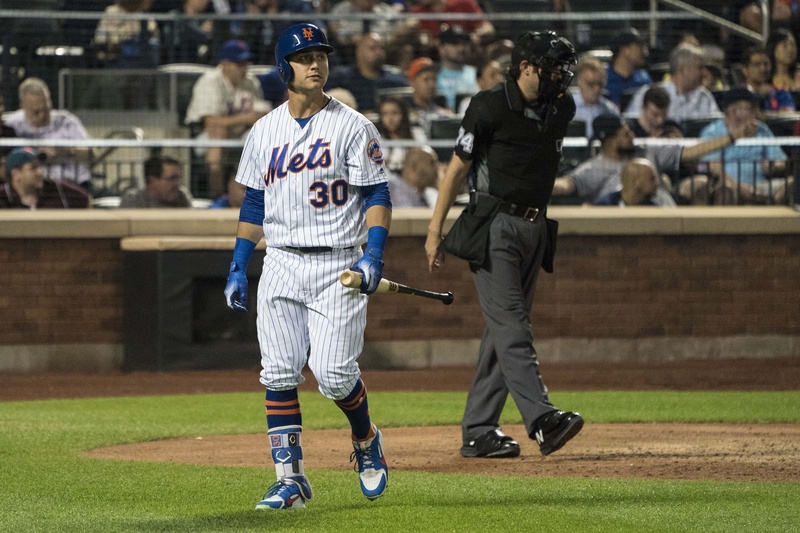 A DL stint for Bruce is way overdue at this point, but the Mets outfield options are thin and it may even be likely that the team has asked him to play through his injury until Yoenis Cespedes returns. That all being said, Conforto has an OBP 40 points higher than Bruce and under no circumstances should he find himself behind the struggling 33-year-old. While he hasn’t looked right at the plate either, Conforto has been working better at-bats than Bruce and has a 97 wRC+ compared to Bruce’s mark of 75. It’s admittedly hard to knock Callaway considering the personnel he’s been given, but his lineups and in-game management have left a lot to be desired thus far. It seemed like Callaway was a genius after the Mets scored three in the first behind home runs from Frazier and Cabrera, but that was all they could muster against Yankee starter German. The Yankees had reportedly been looking into external options to upgrade their rotation, more specifically German, but an injury to Masahiro Tanka Friday likely sees him keep his spot by default. He really settled down after a rough first and struck out nine across his six innings of work. The Mets couldn’t take advantage of runners in scoring position and had just one-man touch third base the entire remainder of the game. While the Mets have gotten incredible production from the starting rotation recently, it’s clear they’ll need to score double-digit runs before any lead feels comfortable at this point. Despite speculation earlier in the week that Cespedes would return to the lineup in time for the Subway Series, the Mets instead chose to seemingly do the right thing by sending Yo out on a rehab assignment with Double-A Binghamton. Well, it turns out that wasn’t the right move either. Cespedes served as the designated hitter Friday and was scheduled to play five innings in left field for the Rumble Ponies Saturday, but he was pulled in just the third inning with tightness in his quad. The Mets desperately need a healthy Cespedes back in the lineup but trying to rush him back from what has been categorized as a chronic injury was far from a smart idea. It’s yet another self-inflicted wound for a team that can’t seem to stay out of its own way. Cespedes will be re-evaluated Sunday, so brace for some potentially bad news.